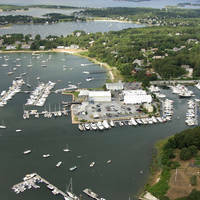 York Harbor is the first major harbor in Maine past the New Hampshire/Maine state line heading north. The image above is a view from the southeast looking northwest over the York River where it empties into York Harbor and the Atlantic Ocean. The rounded gravel spit off to the right (north) side of the image is Stage Neck, while off to the left (south), the tip of Harris Island is visible. A sharp eye can pick out red nun buoy 8 in the lower right-hand portion of the image, while green daybeacon 9 is visible just to the right of Harris Island. 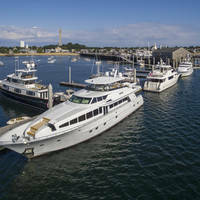 There are three marine service and marina facilities in York Harbor and at least one of them accepts transient guests and another administers some moorings in the harbor area. About a quarter-mile west of green can 3 and red nun buoy 4 is red nun buoy 6, which is followed closely by green can 7, red nun buoy 8, and then green daybeacon 9 at the turn past Stage Neck. Depths on the approach and in the harbor area range from eight to 11 feet. No reviews yet! 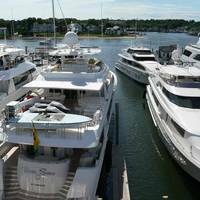 Be the first to write a review of York Harbor Inlet.